Skiddaw appears more and more majestic when approached from these lesser heights. 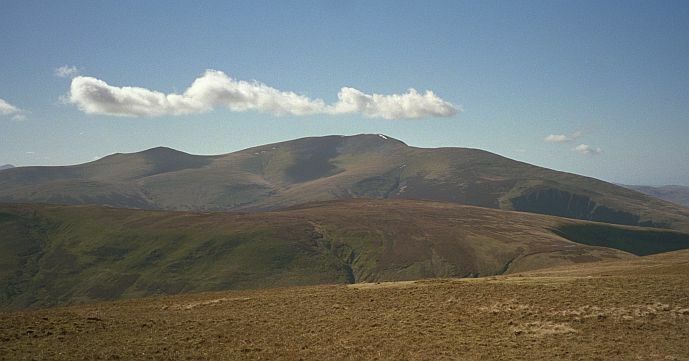 To the left of it are Skiddaw Little Man and Lesser Man, and to the right, Broad End. Bakestall can be seen to the right and below Broad End, above the dark hollow of Dead Crags. The col leading to Great Calva lies on the right and our route continues along the ridge to the summit, off the picture to the left. There's a glimpse of Great Gable on the extreme left, some 15 miles away. Smaller version of this picture.